Mahjongg Dimensions Deluxe Game Review - Download and Play Free Version! Solid audio and graphical qualities. 3D mahjong play is unique. Bonus blocks help solve puzzles in an interesting way. Makes you think outside the box and is challenging. Having only one style of play is detrimental. The game slightly underachieves for the level of potential it has. Mahjongg Like You've Never Seen it Before! 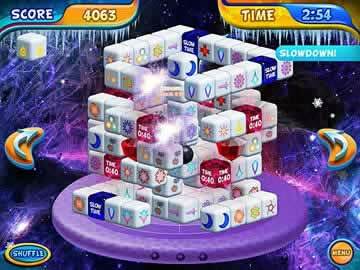 Embark on a journey through the elements while matching mahjongg tiles as fast as you can! But there's a twist-it's mahjongg in 3D! Race your friends to the top of the leaderboard on Facebook in this innovative version of the classic game! Create matches with every tile in under a minute or it's game over. Instead of flat tiles on a flat surface, these beautiful 3D mahjongg tiles are constructed into a cube or another 3D object. The tile you need could be on the other side of the cube but with a spin, the entire game changes! If you make a match every three seconds or less then your multiplier will go up and you'll earn tons of points to send you to the top of the leaderboard! Prove how awesome you are to your friends by topping the leaderboard and even send them gifts like starting multipliers or time bonuses. You Can Play for Hours and Still Want More! Enjoy the adrenaline rush of trying to find your next match in less than three seconds or see your multiplier come crashing down! The social aspect of this game adds fun competition and keeps things lively. With so much excitement and creativity in one game, you can say goodbye to boredom! Do you have what it takes to beat 3D mahjongg and all your friends? Challenge yourself now with Mahjongg Dimensions! Mahjongg Dimensions Deluxe is a unique 3D take on the classic Chinese tile matching game, mahjong. 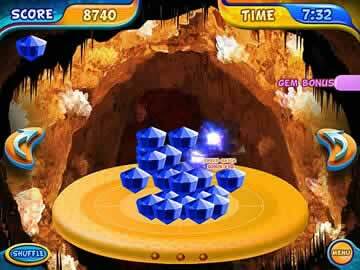 In this game you are faced with a three dimensional cube comprised of smaller cubes. It is your goal to pair the individual blocks with their partner in order to make them disappear from the game space. Each pair gives you points, and pairing with both speed and precision gives you added multipliers. Mahjongg Dimensions is a great spin-off game and poses an addicting and strategy invoking challenge. 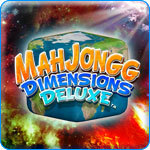 In Mahjongg Dimensions Deluxe you travel from world to world (six in total) to solve three dimensional mahjong puzzles. Each world represents a different element i.e. fire and water, and is comprised of six individual levels. In these levels, which increase in difficulty as you advance, it is your goal to pair all the cubes you can while racing the clock. Unlike the traditional two-dimensional game which gives you access to all the tiles present, this game requires you to spin the game space in order to see all the blocks. There will be times when you will not be able to see matchable pairs on the screen without first rotating the game space, giving you a better overall view. Manipulating the playing area by rotating it by either using the A and D keys or clicking with the mouse, gives this game a great strategic element along with increasing the playability. Bonuses and reward pieces are important ways to increase the speed and likelihood of completing each level. You might find the red gems useful. When paired these turn the entire game space blue, making it possible to pair all the available pieces. Other bonus tiles can add to your total time or slow down time. These are especially crucial late in the game when there is very little time available. Another useful tile is a bomb tile. Once paired this piece explodes, eliminating the blocks in the immediate and vicinity of the paired tiles. This is useful for eliminating big chunks of blocks. This game has several modes that are essentially the same thing. In it you can play the normal adventure-based mode which is timed, or you can play an untimed and casual game. A hard mode is also unlocked after successfully completing levels from the original adventure. All three of these game options are designed on the same premise and incorporate the same accomplishments and goals. The only difference is the level of difficulty or the amount of time you have to complete the level. Having the same or similar modes leads to one of the major limiting factors of the game, monotony. The major flaw of this game is with the limited options of play. Since all the game modes are essentially the same, getting tired and bored with the game is a likely symptom of playing. Opening this game to online play or another game mode would be great for the playability and replayability. This game is revolutionary when it comes to mahjong, however, it becomes boring because there is essentially only one way to play. Mahjongg Dimensions Deluxe is a step in the right direction when it comes to mahjong. The three-dimensional game board along with the bonus tiles add a lot to the game, keeping it entertaining and engaging. Despite only having one style of play this game is very complete and will definitely keep you intrigued.